In the Shasta-Trinity region of far north California, McArthur-Burney Falls Memorial is a well developed state park offering lots of facilities, containing a section of forested land bordering a reservoir (Lake Britton), with a sandy beach popular for swimming and sun-bathing, but the highlight is a beautiful segmented waterfall, formed by the waters of Burney Creek as it cascades 100 feet over a basalt cliff in dozens of separate streams. Below is a deep, blue pool, from where the creek flows through a pleasant, tree-lined valley for a mile, before joining the lake. Trails follow both sides of the stream and allow viewing of the falls from various angles, and although all can be seen in just an hour or so, the waterfall is very spectacular, one of the prettiest sights in north California (see video). 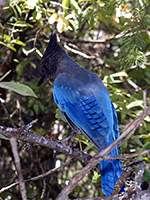 The state park has a remote location surrounded by the Shasta National Forest along Hwy 89 - about half way (50 miles) between Lassen Volcanic National Park and Mount Shasta, and 63 miles northeast of Redding via Hwy 299. The entrance fee (2019) is $10 per vehicle. The many services include a marina, fishing pier, general store, gift shop, cafe (with wi-fi), visitor center, cabins and a 121 site campground, set in wooded land close to but out of sight of the creek. The park road leads past the trailhead for the short hike to the falls, through the camping area and on to a promontory by the lake. 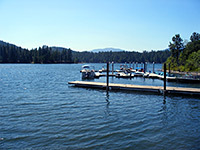 Boats may be rented from here, to explore the 6 mile wide reservoir, which has good fishing for bass, trout and crappie. The 500 foot long stretch of sandy beach tends to be very busy in summer - the shallow waters are ideal for swimming and paddling, and the adjacent woods have plenty of nice picnic spots. 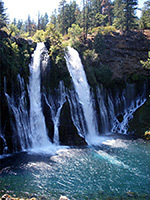 Five miles of paths cross the mixed coniferous forest including Burney Creek Trail alongside the stream to the lake, Pioneer Cemetery Trail to an old graveyard, and a section of the Pacific Crest Trail, but the one big attraction is the falls, visible by a brief walk westwards from the parking area beside the park entrance. A 0.3 mile path descends 200 feet down a steep talus slope to the base of the cascade, while a 1.3 mile circuit (Falls Loop Trail) can be made by walking north (downstream) a way, crossing the creek on a footbridge, turning south and climbing back to the brink of the falls (only limited views available from this side), then re-crossing a little way upstream, back to the start. The creek has a substantial flow - 100 million gallons a day - yet this originates just half a mile south, from large underground springs, hence the amount of water is fairly constant all year unlike most California mountain waterfalls that become small once all the winter snows have melted. 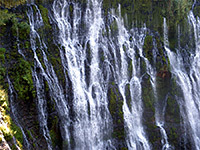 The waterfall has some similarities in appearance to those of Havasu Canyon in Arizona; there are two main torrents plus numerous smaller, more delicate falls, coming out of small holes in the porous cliff face, all surrounded by ferns, moss and other green plants, nourished by the constant spray. The pool beneath is 150 feet across, choppy, deep and lined with big boulders. Most people just walk to the base then return the same way, but the full loop is worthwhile, to experience a more peaceful environment than the often noisy area by the falls. Waterfall and creek are named after Samuel Burney, a pioneer settler in the late 1850s; the park also commemorates another local family, the McArthurs, who purchased the neighboring land to save it from development, and subsequently donated it to the state. 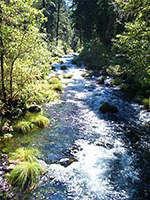 The nearest main towns with hotels are Mount Shasta and Redding.